Coating & Laminating machines are important machines that that consists of various parts like Surface Coating Unit, Drying Chamber, lamination Winding Unit, Centralized Control panel etc. Moreover, the Centralized control panel is equipped with Heavy Duty base that helps to carry out operation without vibration. It is a machine that benefit s in various ways as it is cost effective way of to reserve various things like photos, business cards, documents etc. The benefit proves to be ore significant because lamination is one of the easiest way to protect documents as it protects the document from any kind damages from the environment. 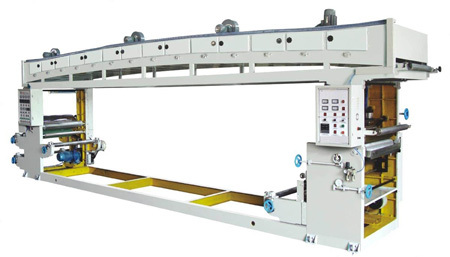 There are two types of coating and lamination machine. They are distinguished on the basis of formats as one is a pouch laminator and the other is roll laminator. Pouch laminators are mainly used in case of pouch that are small and compact whereas roll laminators s are used in the lamination of large materials or can also used for laminating a lot of small materials at a time. The coating and lamination machine is a Modular design to enable suitable extensions /alterations in future. It is an extremely efficient Converting Machine and has been specially designed for our Integrated Project. This unique Coating /Laminating Line is suitable for Pre-Coating of Clear Films and Paper for Metalizing and Holographic Embossing, as well for converting Narrow Web Holographic Films into Sticker and Hot Stamping Foil. It can also be used for Single Colour Coating of Wide Web Metalized and Holographic Films for manufacturing Packaging Films, Holographic Gift Wraps etc. The Coating and Laminating Line includes a Surface Coating Unit, Drying Chamber, Laminating/Winding Unit and Centralized Control Panel with Heavy Duty Base and Dampers to ensure Vibration Free Operation and Superior Finish. Type of Substrates (Films etc. ): PET, BOPP, CPP, PVC, Al. Foil, Paper etc.